“There is a certain philosophy and practice in India that you don’t find anywhere else. 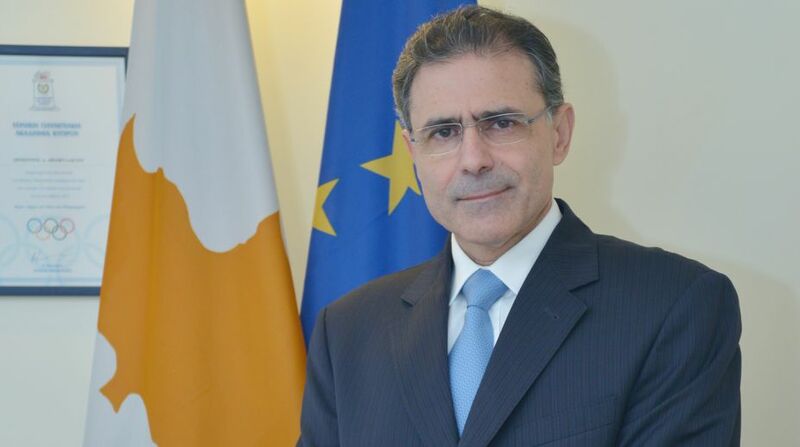 When I see people living here do not take advantage of that, I think they are missing out on the basic foundation of this culture.” This is what the outgoing High Commissioner of the Republic of Cyprus to India, Demetrios A. Theophylactou, feels about India after spending the last few years in the country. He is returning to Cyprus on May 4 and will be replaced by Agis Loizou. Giving him a farewell, the Cyprus High Commission organised a painting exhibition on 20 April, with its theme exploring the common roots of Cyprus and India. In a candid chat with TheStatesman.com, Demetrios A. Theophylactou said how Yoga and Ayurveda became a part of his life during his stay here. He also spoke about his stint in general, the challenges he faced in India, the aspects he loved and the areas he thought needed improvement. How did you find your stint in India? Well, it was quite engaging. (There were) a lot of activities and a lot of interactions at different levels, both official and unofficial. There were three tracks. One was to promote political relations as well as economic (relations) at the official level. I had to bear with a very thorny issue initially, which was the double taxation treaty. We managed to have that revised. That itself triggered a lot of activity and interest on the part of both business communities and the financial sector. The private sector is very important when it comes to economic diplomacy. On these two tracks, there were a lot of activities. There were significant, tangible results. The other track was cultural diplomacy. We tried to project and promote culture and the common roots. We have had theological exhibitions, we had photography exhibitions, we had fashion shows, we had musical (shows). I can say that there was a lot that was done. How did you find India? There were things that I found at once difficult, and fascinating. India is not easy to understand, unless you are willing to understand it and to accept certain things the way they are. There is a predominant culture (here) but there are a lot of ethnic groups, different languages. It’s a vast country. I saw a lot of it. Of course, there are some challenges that need to be overcome but there is positive side of the coin that one has to look at. One should focus on the positive, (though) that doesn’t mean you avoid or neglect the not-so-positive aspects, because they affect your daily life. There is pollution that needs to be addressed. There should be collaborations with respect to climate change, clean energy and efficient transport. We need to address practical issues…in terms of agriculture, education, research and development, innovations. These things very much constitute the evolution and transition that is taking place now in India from a rather developing to more developed economy. In geopolitics, in a global economic and political landscape, India plays a significant role today. Not only because it’s the largest emerging economy but also in terms of security, in terms of balance of power in the new realities in Asia, in the region and beyond. I have come out much more rich, and more enlightened in many ways, because of the spirituality, philosophical foundations — even the contrasts. There are very strong contrasts (here), which make you think how a society with so many contrasts can sustain itself. In a nutshell, In India, there are a lot of opportunities, and at the same time a lot of challenges. This is what I will take with me. I hope to stay engaged with India in different ways, if especially I become in charge of the Asia department – we call it Asia Oceania (department). Were you able to see much of India? I went to most of the happening places. Whether it’s the financial sectors such as Mumbai, Bangalore and Chennai, or cultural places in the south, east and the northeast, and Kolkata, I went to many places. I have seen this variety of landscapes. I went to Kashmir, twice. When I look at the map, I can say I went to all of the places, and to some of them many times. Any place you missed out? Yes, Varanasi. Also, Sikkim and Odisha. Did you try Indian food? Of course, yes. Every day, actually. I liked the food from south the most. North Indian food is good, but spicy. I especially liked the food in Kerala. Food was really good (there). That’s one of my favourites. In Kashmir, I tried some very good quality food. I also discovered in the process, because of your traditions and preferences in food, vegetarian food. I am (now) more likely to be a vegetarian than not. Overall, I have realised in India spice is not necessarily peppery, there are different spices that are good for your system. What do you think about the political situation in India? We discussed this quite thoroughly, and in a rather exhaustive way, with our colleagues here. One has to be informed and to be educated, not only through the media but also through a lot of interactions with people who are part of the system or who are the decision makers. One particular forum, which is very useful, is the EU Ambassadors’ meetings that we have. These are extremely useful because we have 28 different countries and when we share the experience and the understanding for evaluation of the political landscape, not only internally but also in respect of the regional politics, that itself is significant. The positioning of the country (India) in the region is adapting to the new realities. There is a clear drive to modernise the economy, to modernise society, to modernise your defence, and to position yourself in the area of maritime security. The Indian Ocean is in your backyard. And I think India is realising the laggards in terms of engaging and investing in the particular area, and now they are working towards it. India has started an Ease of Doing Business initiative. Do you think it has helped foreign investors? Well, yes. But we think, and the government also knows that, more needs to be done. Of course, it’s a good first step and in the right direction. It has already attracted some kind of positive attention, and there is a lot of interest in investing in India. Ease of Doing Business is a process that needs to be taken further. There is room for more improvement. Is there any specific interest on part of companies from Cyprus to invest in India? There is of course interest on part of different companies in coming and “make in India”. Two beer manufacturing companies want to come and are in talks. I will go back to the headquarters, the Ministry of Foreign Affairs of Cyprus. And what I would like to do there, if possible, is to continue working with India and Asia in general through the Department of Asia and Oceania. After a certain period of service in the capital (Nicosia), I will go to my next posting.